Activists hoping to convince New Jersey State Legislators of a need for name tagging on all kegs of beer sold in the state, hope to see the end of the underage keg party. New Jersey activists concerned about underage drinking hope to see name tags affixed to any and all kegs of beer sold or rented across the state. Police breaking up underage drinking parties often confront a pack of drunken kids and an anonymous keg of beer, with no way of knowing who bought the beer, or who to charge for the crime. Now lobbyists hope to convince state legislatures to impose mandatory tagging on any kegs of beer sold in the state; tags that would contain the name and address of the purchaser – leaving anyone buying beer for minors in potentially serious trouble. The New Jersey Liquor Store Alliance is not surprisingly opposed to any efforts to further legislate the sale of alcohol, weakly proposing that tagging beer kegs would only move teens on to hard liquor drinking. Surprisingly, momentum for the state wide statute came only after a state official called municipal statues requiring the tagging of identities to kegs problematic. 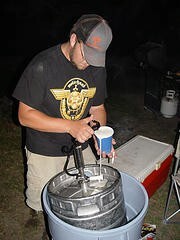 Jerry Fischer, Director of the State Division of Alcoholic Beverage Control, wrote that selected and scattered legislations requiring for keg tagging meant that someone buying beer legally in one municipality and bringing it into another municipality (one that required tagging) would result in a crime. He argued that the enforcement of such scattered legislations was problematic, and that it was not the job of any municipality to enforce legislation on another municipality. Although his arguments seemed a blow to activists calling for tagging, the response has been a concerted move to state level lobbying, and a potential state wide requirement for beer keg tagging before the end of the current session of legislature.